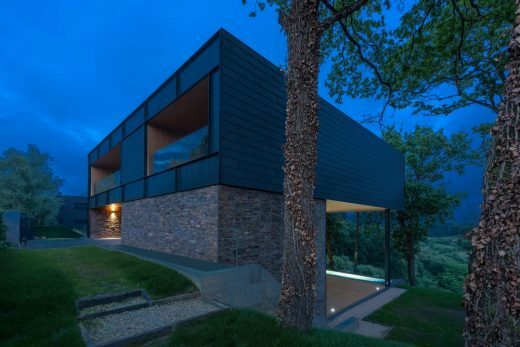 The house, which was built in six months using the industrialized construction system of Sustainable Energy & Housing (SEH), with a steel structure and patented enclosure walls, takes up a plot of land in a residential area on the outskirts of Bilbao in a setting with oak forests situated between two streets generating a steep slope. 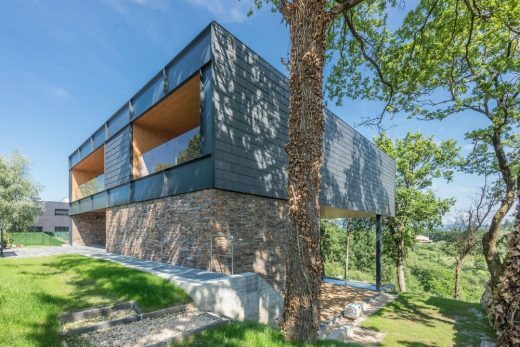 The project consists of an isolated building, with a ground floor and a first floor, as well as a semi-basement which sits on the hillside, in the space generated by the hill as it slopes down, producing as little impact as possible and involving the least amount of civil work on the site. 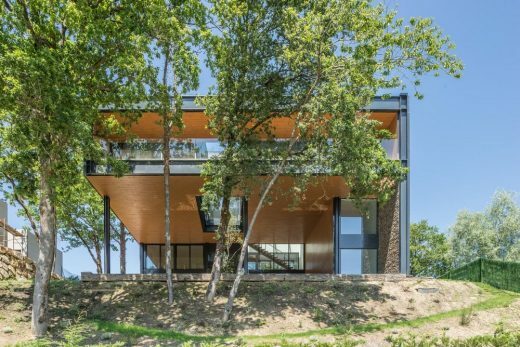 The home looks like a building floating among the trees tops so as to blend with the existing nature, seeking the best views and the sunlight. 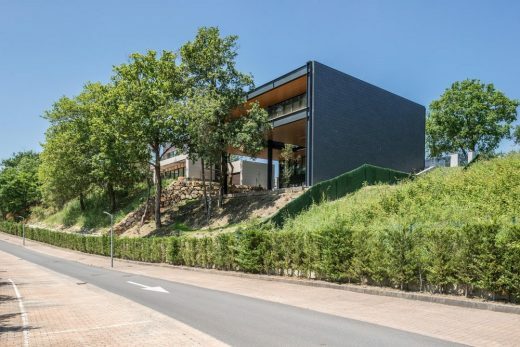 The programme for the home is developed in three levels: On the ground floor, on either side and with a separate access, we find the office and the garage, and in the middle the porch and the access hall. The vertical and communication core area goes from the semi-basement to the roof, creating a glass prism which joins all the levels. 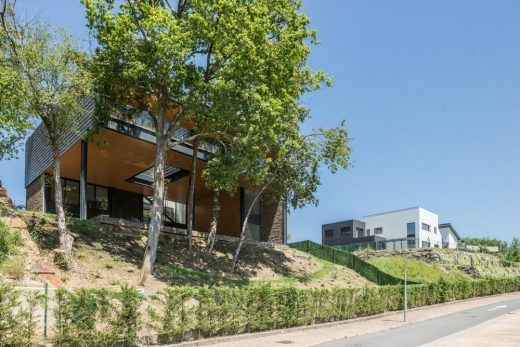 On the first floor is the home, which has two courtyards, the southern courtyard which divides the day and night areas and the glazed northern courtyard where the communication core area is situated. 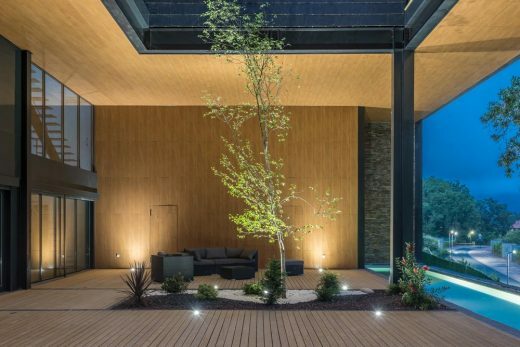 Two outdoor terraces run along both facades with each having its own way out. On the semi-basement there is a living-room, a kitchen and a facilities room. 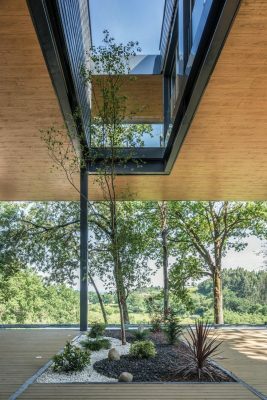 Both make up the atrium, a double-height area generated below the home where a considerable part of the outdoor life will take place, recovering the landscaped area on which the building is situated. 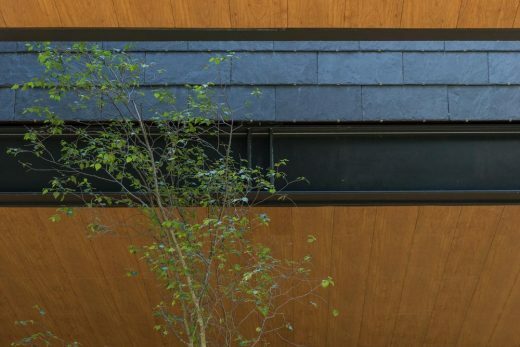 In the atrium there are two landscaped areas, which integrate nature into the space generated. A longitudinal swimming-pool closes the perimeter with a sheet of water which merges with the horizon and the views. 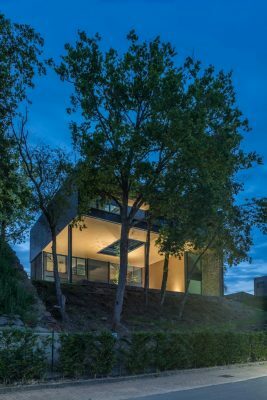 The architects wanted it to blend with the natural landscape while improving the efficiency of the studio. 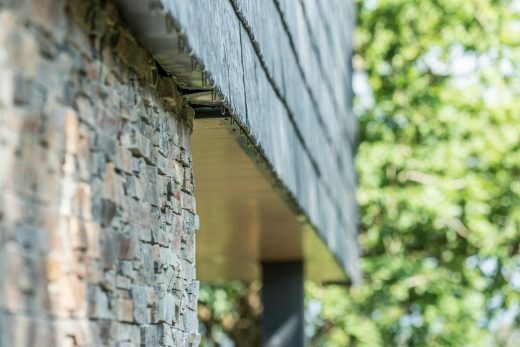 That’s the reason why it was decided to install CUPACLAD 201 Vanguard, a natural slate rainscreen cladding system that enhances the look of the building and matches perfectly with wood and stone panels. 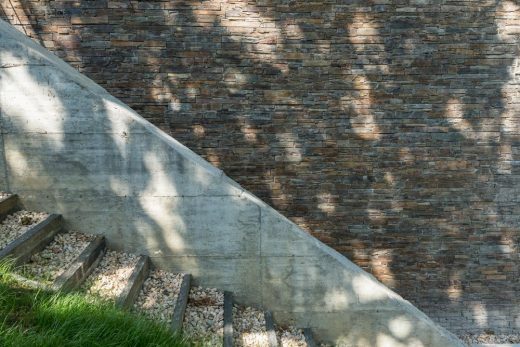 Other natural materials obtained from nature, such as stone, have been used in order to obtain good living comfort as well as a contemporary look. Part of the facade is cladded in STONEPANEL™, the only natural stone panel guaranteed and certified for outdoor use. This innovative system of CUPA STONE has an incorporated mechanical anchor for installation on surfaces higher than two meters. These panels are certified by the most prestigious European organizations such as BBA-Agrément Certificates in the United Kingdom. INFERCOA slate, an exclusive CUPA STONE product, has been used for the swimming pool edges. Highly versatile, INFERCOA is a unique black toned slate used for any kind of interior or exterior applications. 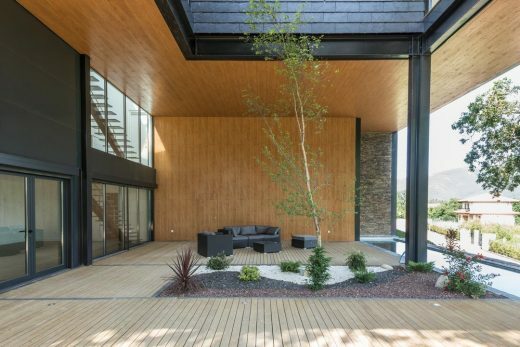 Resistant, adaptable and elegant, INFERCOA also creates natural environments in different parts of the garden. Finally, its high anti-slip coefficient with a characteristic rugged finish makes it the ideal paving for the front yard of the house. 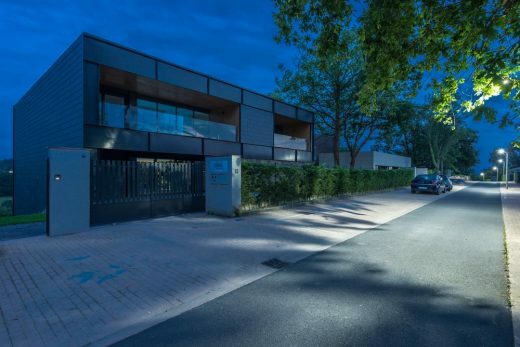 The building has been enclosed with multi-layer technical panels made ad-hoc for this project, with regard to the formats as well as the composition and machining by the company Thermochip SLU in close collaboration with SEH. The needs and demands of this type of construction required a further step in the development which Thermochip has been carrying out for more than 32 years. Special panels were manufactured for each use in the project such as: framing, interior lining, partitioning, false ceilings, façade and roof cladding, using a different panel in each case. The interior framing was carried out with three-layer panels comprising a double OSB3 structural board and an XPS core and the exterior framing was carried out with three-layer sandwich panels comprising a structural OSB3 board, an isolating XPS core and a wood-cement board. 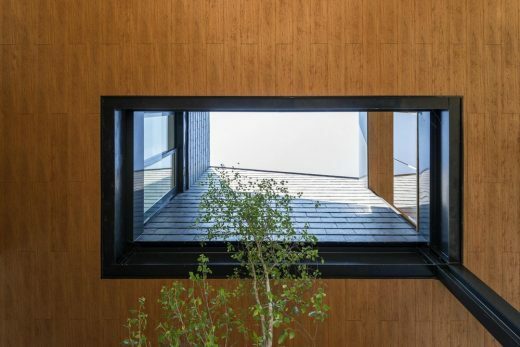 The interior lining of the facades was carried out with four-layer panels comprising a double OSB3 structural board, a laminated plaster plate and an isolating XPS core. 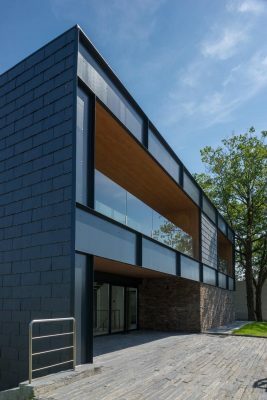 The facade cladding panels were made with three-layer panels comprising a structural OSB3 board, an isolating XPS core and a wood-cement board on the outer side. The false interior ceilings were made with two-layer panels comprising a laminated plaster board and XPS, quite similar to the panels used for the interior partitions, with three-layer panels comprising a laminated plaster board and XPS, the same as those of the false ceiling, to which a structural OSP3 board was attached. Finally, the roof was made with standard three-layer Thermochip boards, comprising waterproof chipboards, XPS and wood-cement boards. All Thermochip panels, except those used in the partitioning, were fixed and screwed to the structural metal system developed and patented by SEH, which provides structural stability to the whole building. Thermochip Deco panel was also used in the building to line the large courtyard’s ceiling and wall, as well as to line its magnificent balconies. 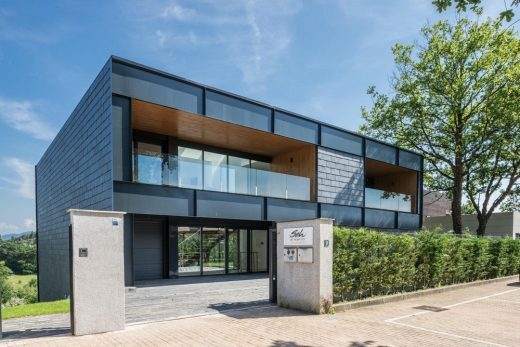 This project has meant a qualitative leap with regard to the production of panels for Thermochip and this evolution has been carried out hand in hand with SEH. 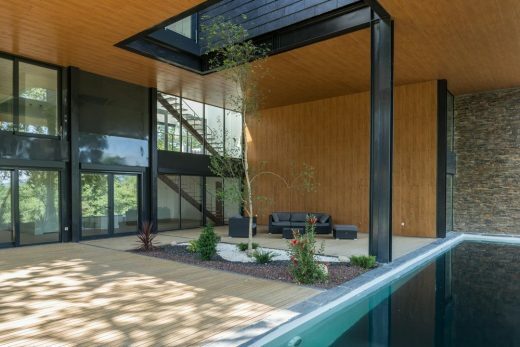 The home is a Net Zero Energy Building (NZEB). The thermal energy which is necessary to make it self-sufficient is generated in the home itself, combining aerothermic and a photovoltaic system with battery. Heating, cooling and domestic hot water generation through a High Efficiency Air Water Heat Pump manufactured by Vaillant. Thanks to this technology the efficiency of the system overcomes a ratio of x4 performance over the electrical power supply used. The Vaillant technology for heat pumps includes the patented Piharmonic® system which ensures extremely quiet operation that leads to the maximum comfort of the user. Photovoltaic system to feed the aforementioned heating and cooling system, able to provide all the electricity needed, as a battery has been installed for the night operation of the system. Central domestic ventilation system to renew indoor air inside the building, but diminishing losses in the exchange with outdoor fresh air. This fresh air which is conducted indoors is cooler in winter and hotter in summer than the indoor air, therefore the Vaillant manufacturer technology used for ventilation includes a heat recovery system that maintains the indoor temperature when exchanging with the outside. The system is equipped with sound absorbers to ensure a quiet performance even overnight, and the small size of the units allows for easy lay out.